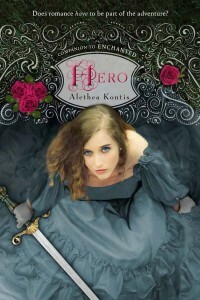 My favorite fairy tale writer, Alethea Kontis, pulls off another slam dunk with HERO, the second of her stories about the Woodcutter sisters. HERO is a gender-bending, swash-buckling tale about Saturday, the second youngest sister to Sunday, whom we previously met in Enchanted. While Sunday was a whimsical girl with an art for words, Saturday is a strong and willful girl with plenty of heart (plus some added snark). Her story proved to be just as enthralling as the first! Alethea has a knack for reminding readers why many of us love fairy tales to begin with. In this entry we are once again given a delightful story with some obvious (and some not-so-obvious) nods to classic tales, such as The Sleeping Beauty, Rapunzel, Rumpelstiltskin and more. It was so much fun picking out the various references. Just like Enchanted, HERO is built upon these familiar stories, but her overlying story and characters are entirely of her own creation. You never think “Wait, this is just a retelling of Cinderella!” or “I feel like I’ve heard this before…” because Alethea’s story and characters are wholly unique and distinguishable – not to mention they have so much more personality. CLICK HERE to read more of Jenna’s spectacular review…and then enter to win your very own collector’s edition ARC of HERO! Thank you, Jenna. You are my Hero! This entry was written by Princess Alethea and posted on September 18, 2013 at 9:40 pm and filed under contests, Hero, Reviews. Bookmark the permalink. Follow any comments here with the RSS feed for this post.